Lely North America is excited to introduce one of the three judges of The Way To Dairy Award, Dr. Jodi Wallace. Dr. Wallace has been involved in the dairy industry her entire life. 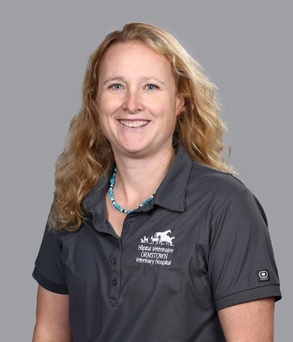 She grew up on a dairy farm in Herdman, Quebec, Canada, and in 2002, received her bachelor’s degree in Veterinary Medicine from the University of Guelph. Dr. Wallace began her career at the University of Cornell, Quality Milk Production Services, before going to a dairy practice in Mirabel, Quebec, Canada. In 2004, Dr. Wallace returned home to Ormstown, Quebec, Canada, where she began her work as a veterinarian and associate owner at the Ormstown Veterinary Hospital. She completed her Master of Science in Veterinary Science from the University of Montreal in 2009. In addition to everyday veterinary practice, Dr. Wallace performs calf health and milk quality consultations conferences, and seminars for dairy producers and veterinarians throughout Canada. Dr. Wallace is also a 6th-generation dairy producer. She lives with her husband and four children on their dairy, Anderson Farms, in Howick, Quebec, Canada. Anderson Farms is focused on calf health and is a two-time medal winner in the National Order of Agricultural Merit competition, placing in 2010 and 2015. Lely North America announced the award earlier this year as a way to recognize the most progressive dairy operations who want to maximize each cow’s potential, while changing the daily tasks on the dairy to be more sustainable, profitable and enjoyable. The four finalists were announced at the Canadian Outdoor Farm Show and World Dairy Expo. The grand prize winner, receiving their choice of either a new Lely Astronaut A5 milking system or a recently re-launched Vector feeding system, will be selected by the panel of judges and will be announced no later than December 22, 2018.